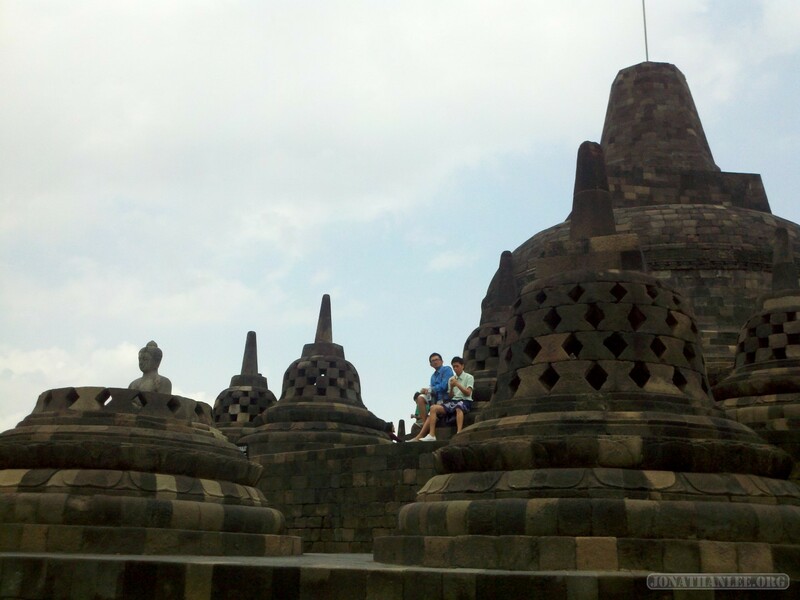 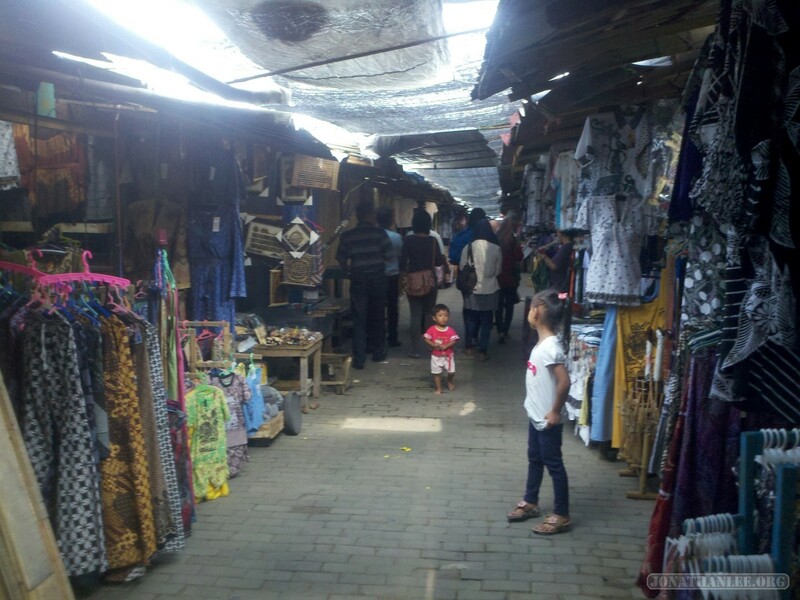 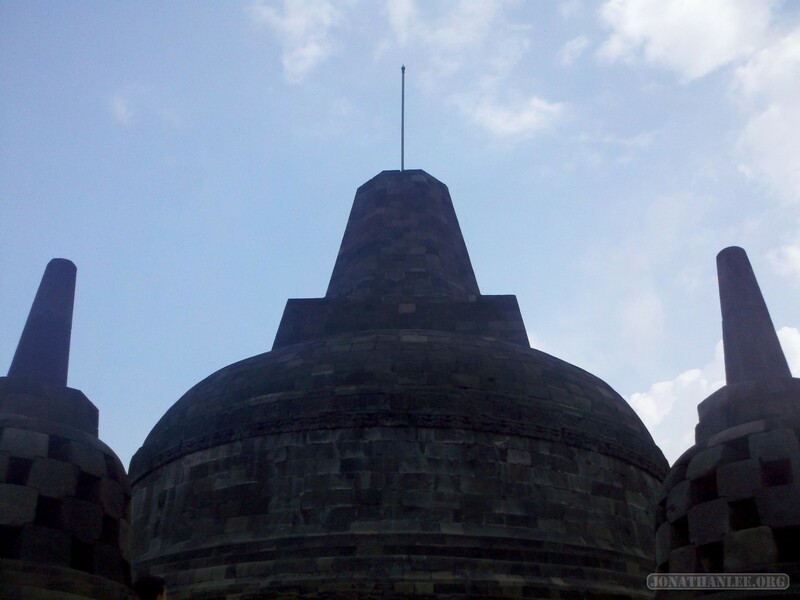 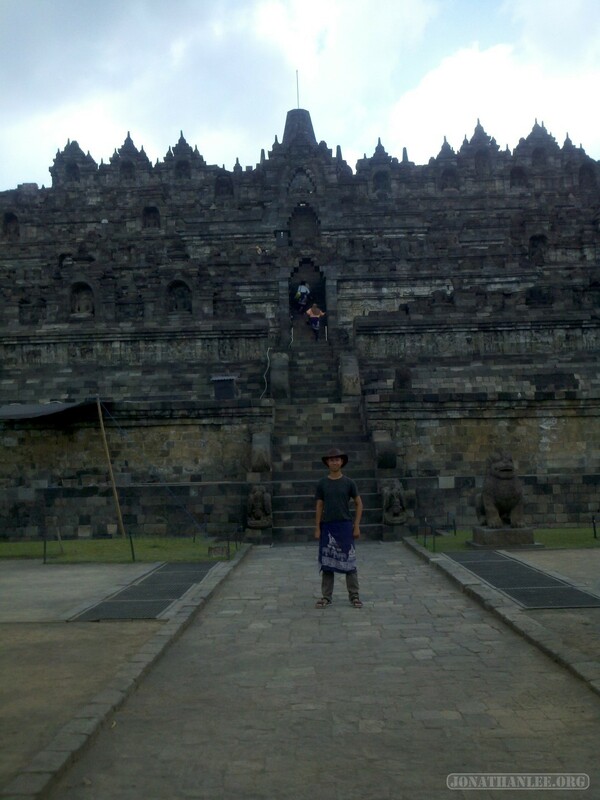 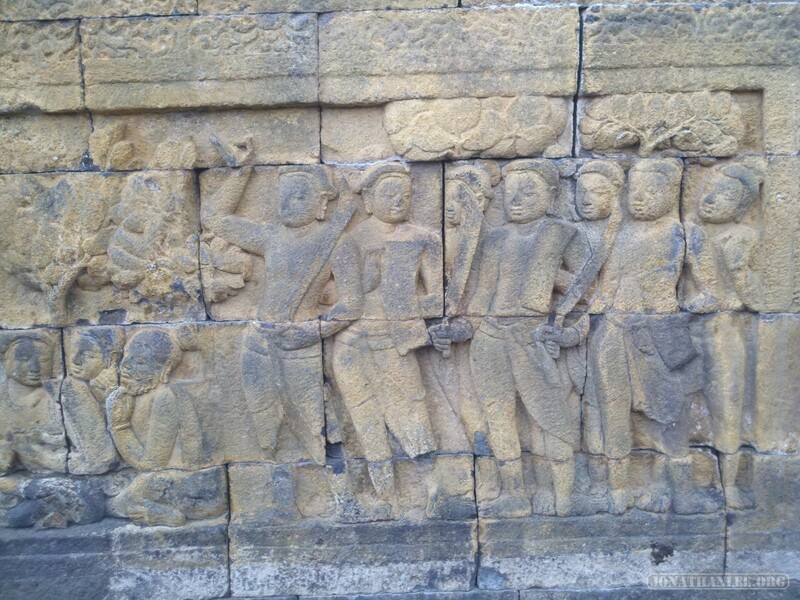 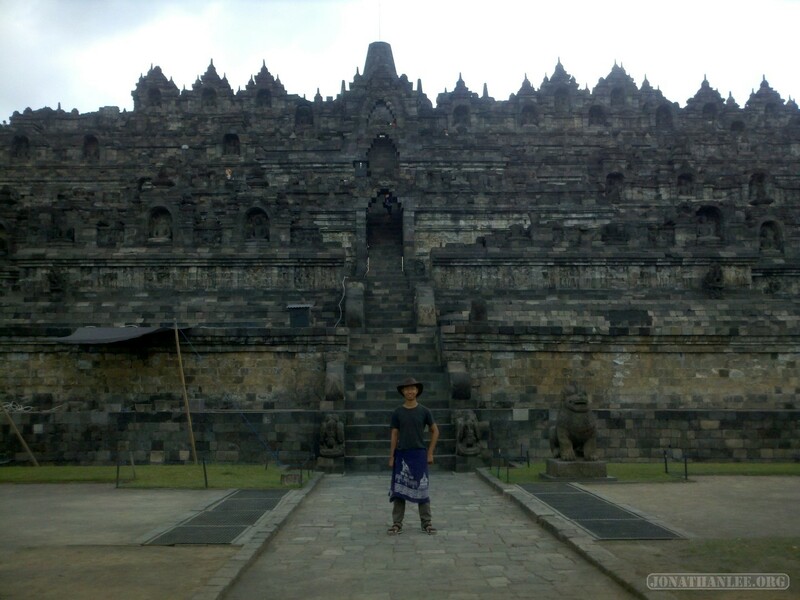 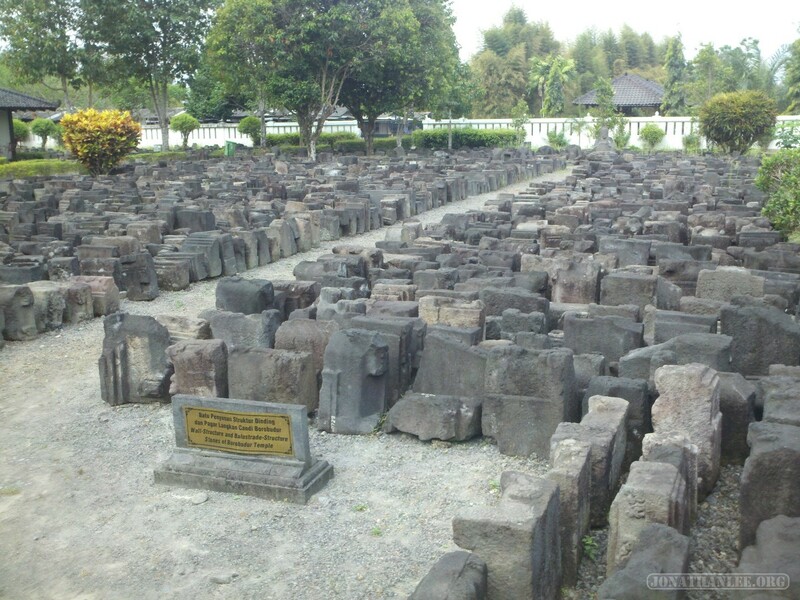 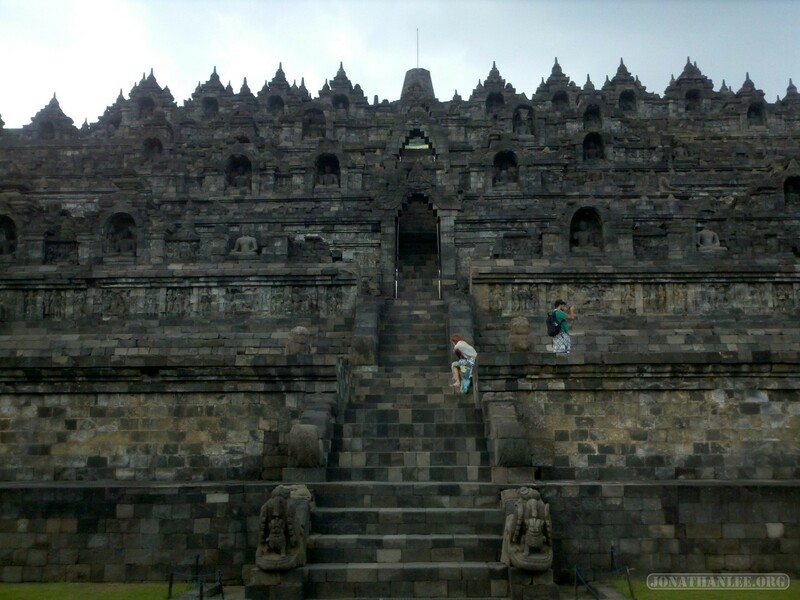 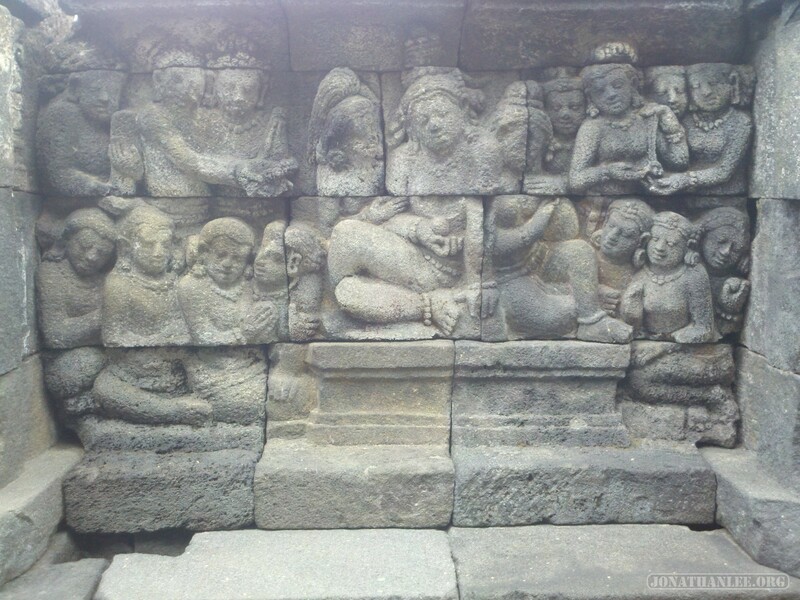 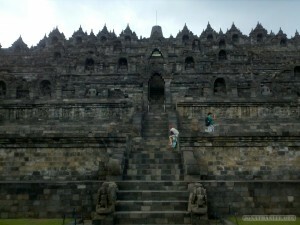 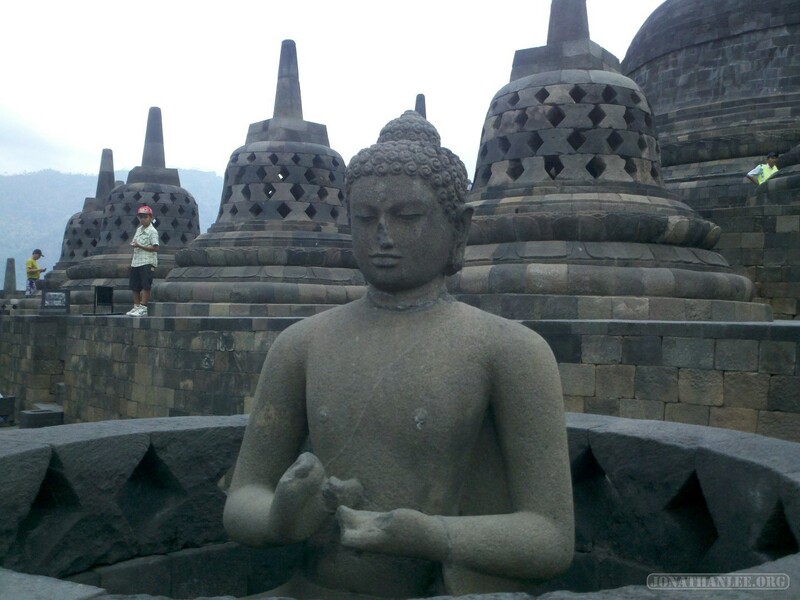 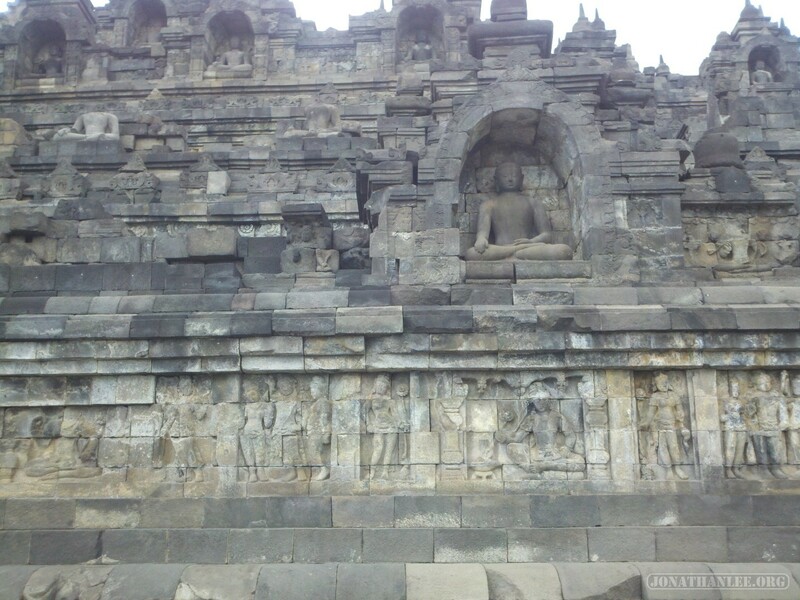 Contrasted with Prambanan, which is a collection of buildings, Borobudur is one giant structure. 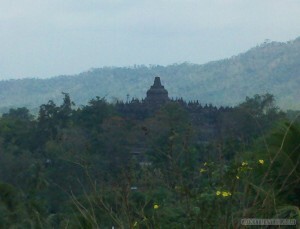 Viewed from afar, it’s quite impressive. 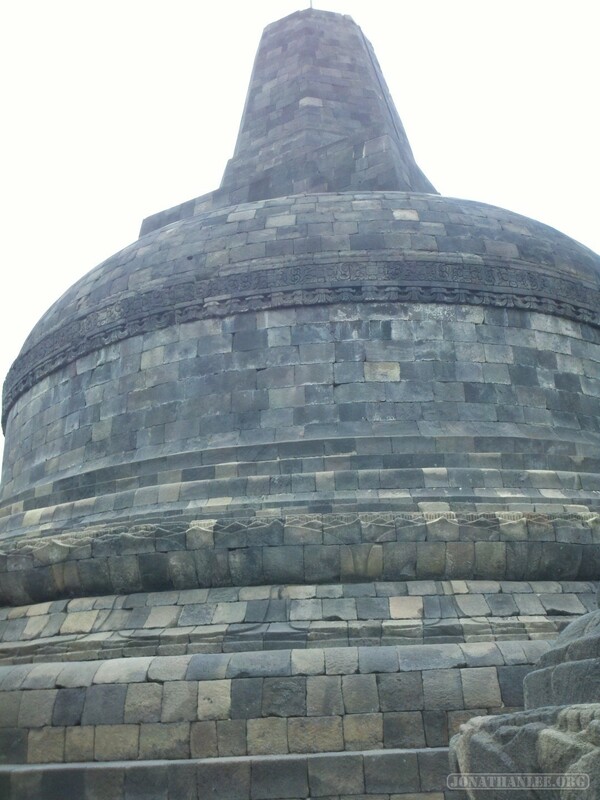 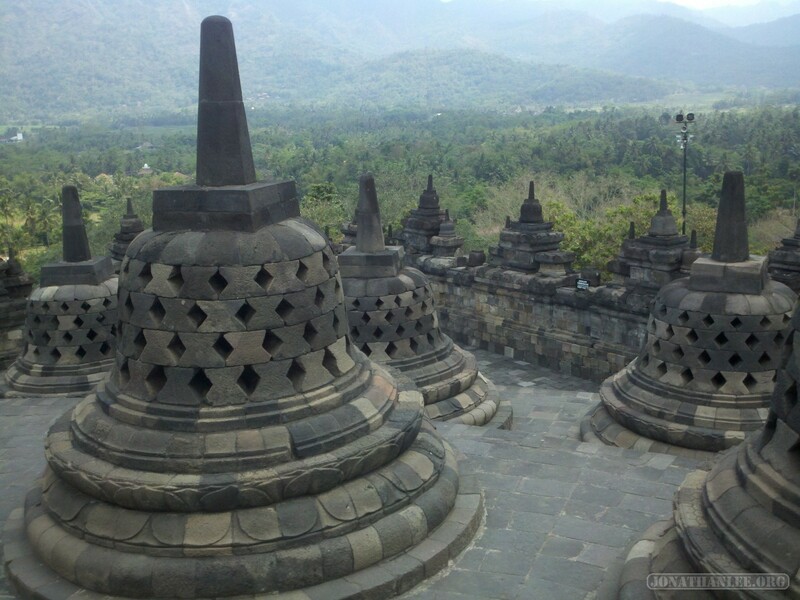 You’re not supposed to just climb directly up to the top of Borobudur. 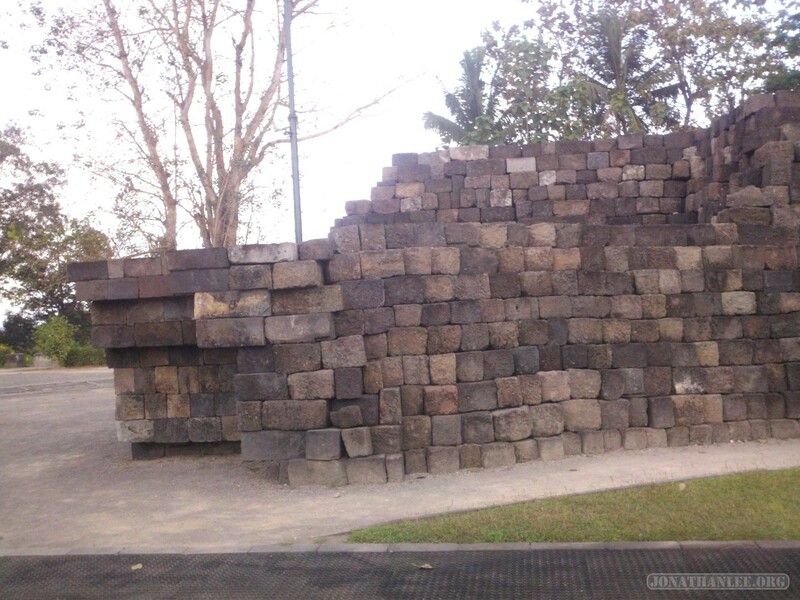 Instead, you’re supposed to climb up one level, walk around the structure clockwise, climb up another level, and repeat until you reach the top. I have no idea why you’re supposed to do so, but the signs the site said so. Unfortunately, the signs explaining why you’re supposed to do so, were not translated into English. 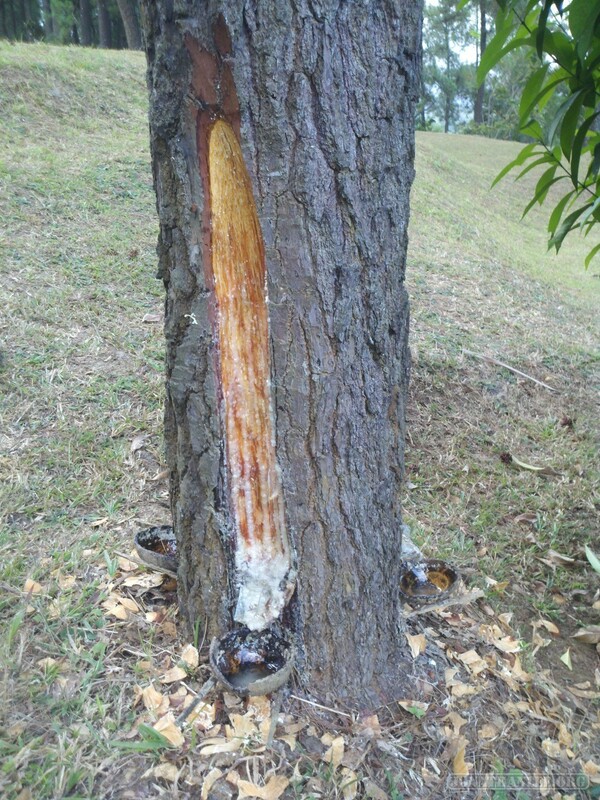 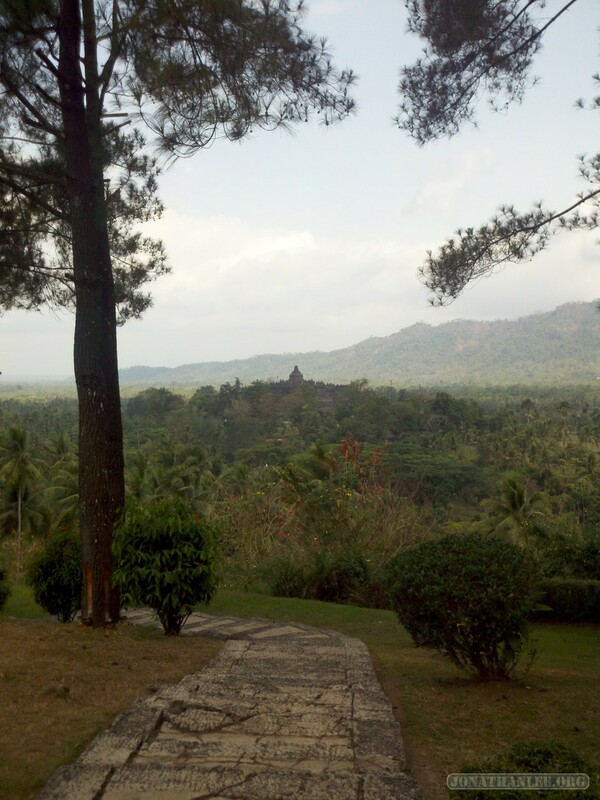 In total, it was a good 5km walk. 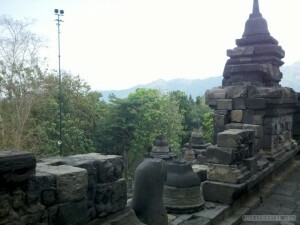 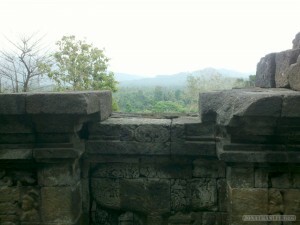 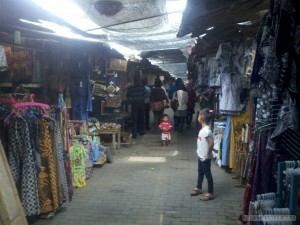 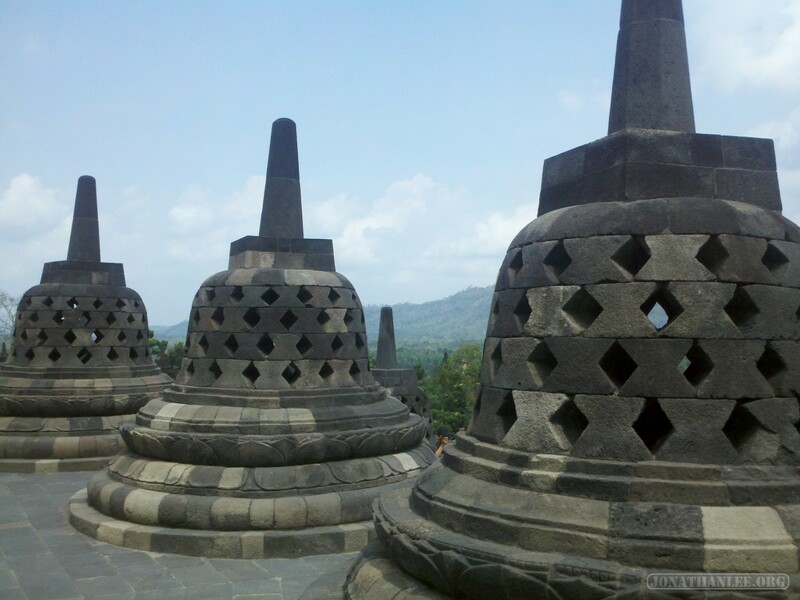 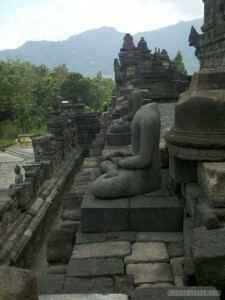 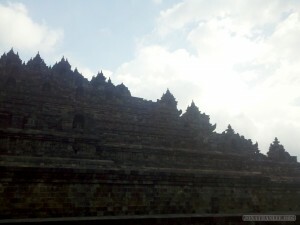 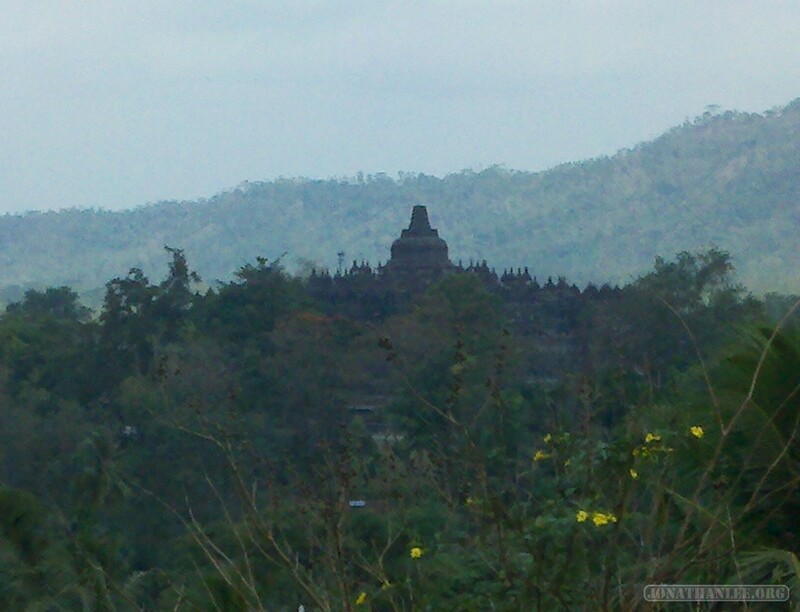 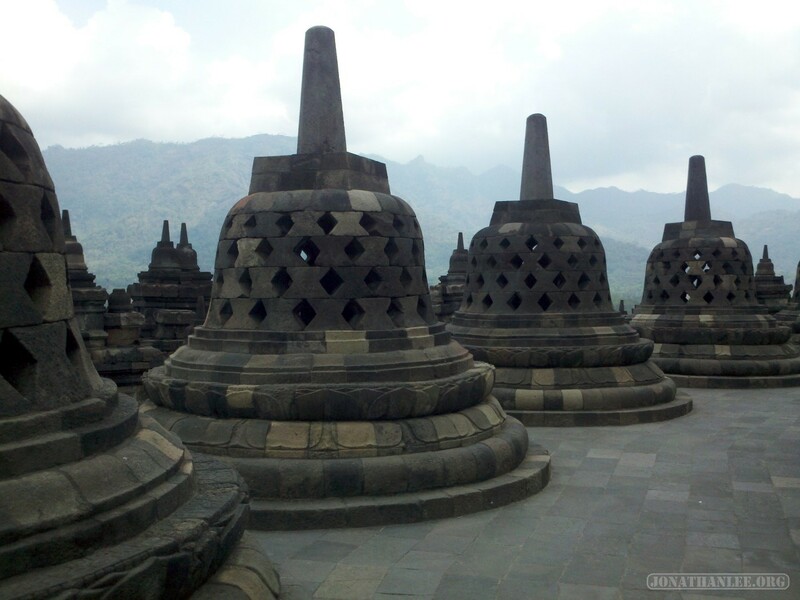 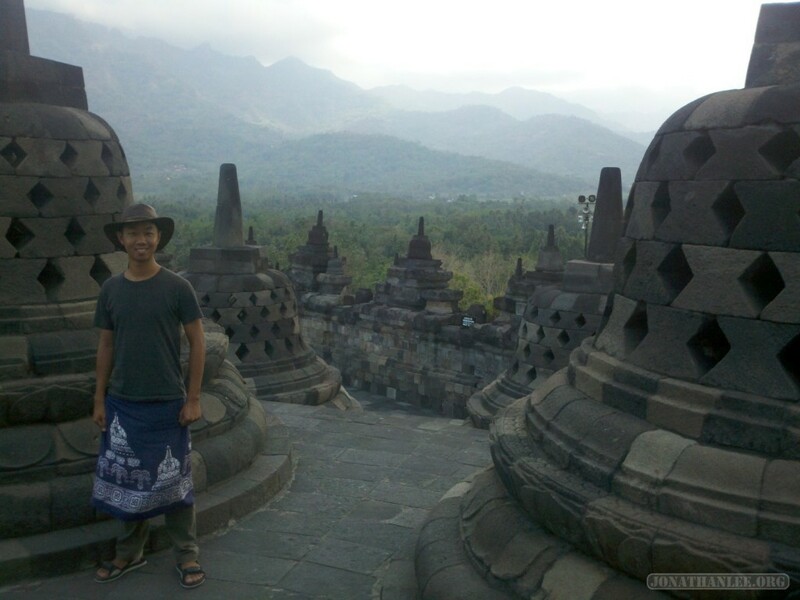 The views from the lower levels is pretty good, since Borobudur is surrounded by forests and mountains. 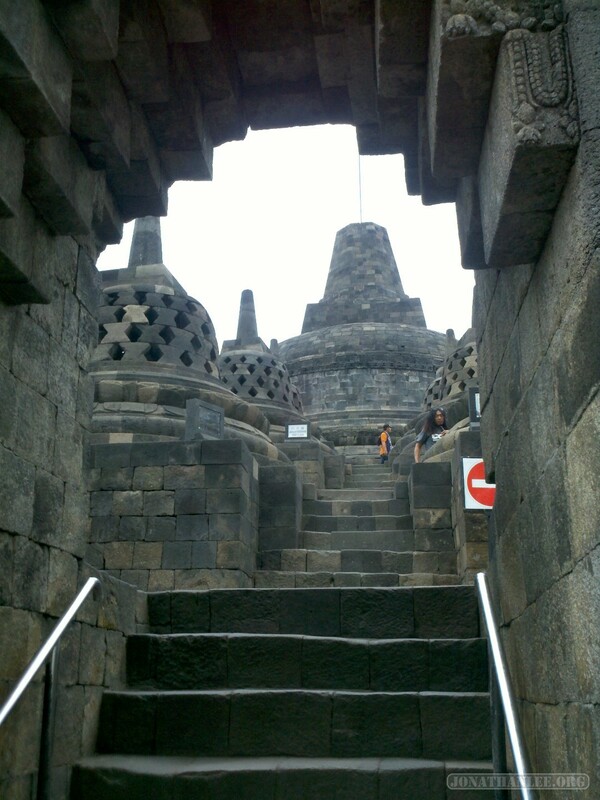 The sunrise view is supposedly amazing, but I couldn’t bring myself to wake up yet again at 3am for yet another sunrise tour. There’s a lot of stairs, but you eventually reach the top. 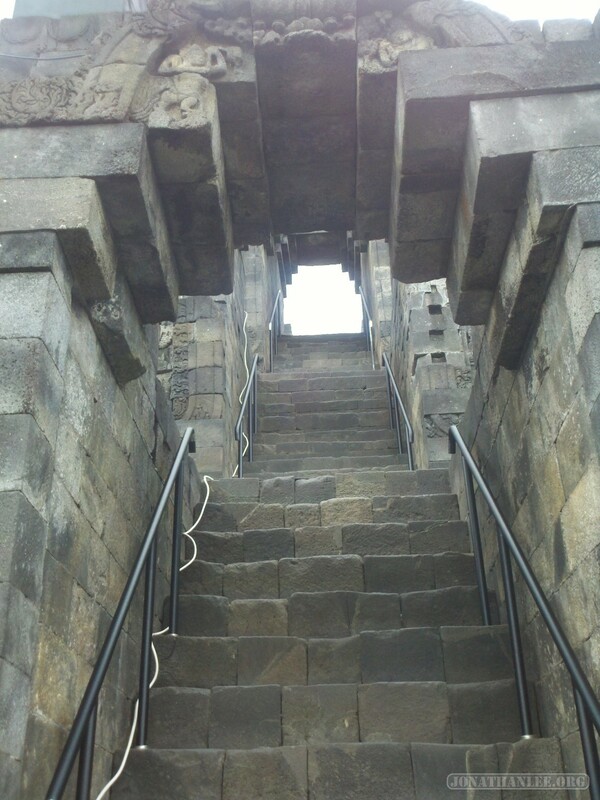 One set of large Americans were huffing and puffing by the time they reached summit! 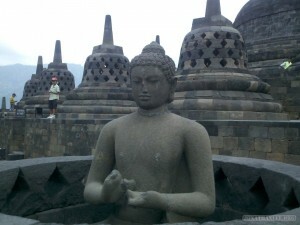 And inside each stupa, you have a Buddha! 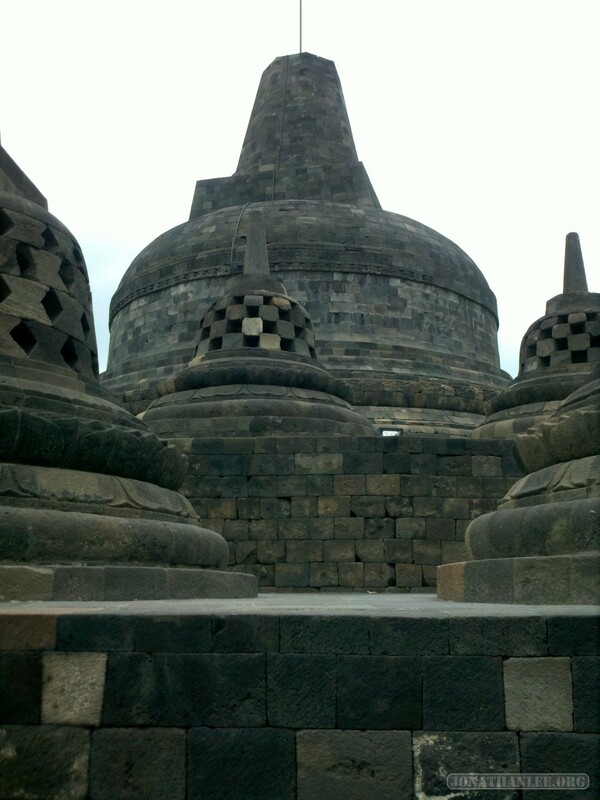 Kind of like those capsule toys. 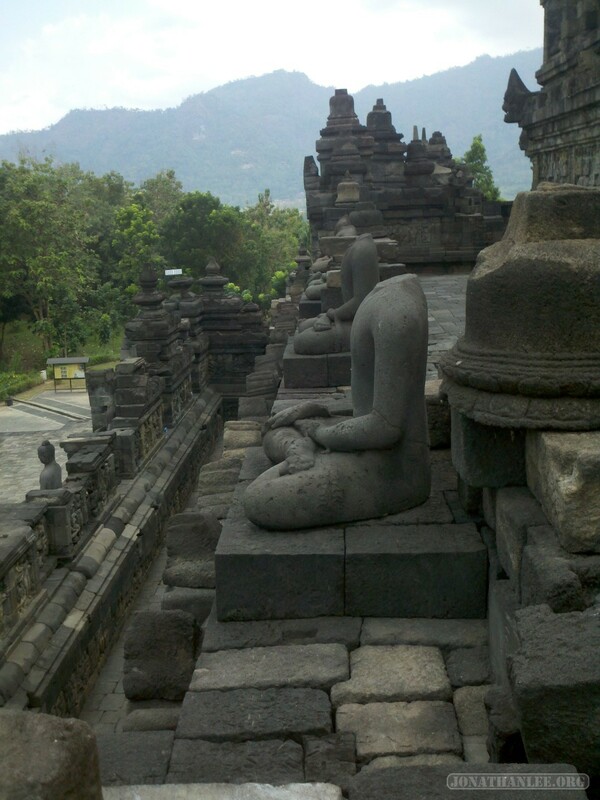 Spare pieces (and yet-to-be-fit-in pieces) from the reconstruction. 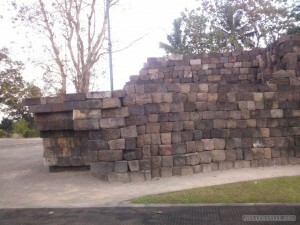 Good luck figuring out where these pieces go!